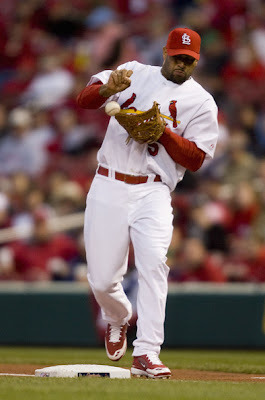 I realize Albert Pujols is the toast of St. Louis, but does he have to be its official host as well? Major League Baseball was the host of the 2009 All-Star game, regardless of the fact it was held in St. Louis. Albert Pujols is an All-Star ballplayer, perhaps arguably the best ballplayer period. So, that's what he should be, a ballplayer. And a first baseman by trade. So what's with Albert catching the ceremonial first pitch? That should be a catchers pleasure (after all, he was a Cardinal too, if that was a prerequisite Tuesday night). I like Albert Pujols. He's a great guy who does great charitable things away from the field, and performs at a tremendous level on the field. I think this time he just got caught up in the hype. From a disappointing exhibition in the Homerun Contest, to a lackluster performance in the game itself. Only two outstanding defensive plays kept him away from the 'average' category. Going 0 for 3 at the plate and committing a run scoring error in the first was not your typical superstar performance. If his Cardinals make it to the World Series, perhaps he will look back on his performance when he realizes the American League has home field advantage due to their victory last night. Not to worry though Albert, you won't have to host the Series. You can just stick to the games themselves. And just first base at that.